A denture is a removable replacement for missing teeth and surrounding tissues. There are two types of dentures available: partial dentures and complete dentures. Partial dentures fill in missing teeth when some natural teeth remain and complete dentures replace all teeth. Partial and complete dentures are made to resemble your natural teeth, so there should be no noticeable change to your appearance. In fact, partials and dentures may even improve your smile! This restoration method is used to restore smile and mouth function if all teeth have been lost. 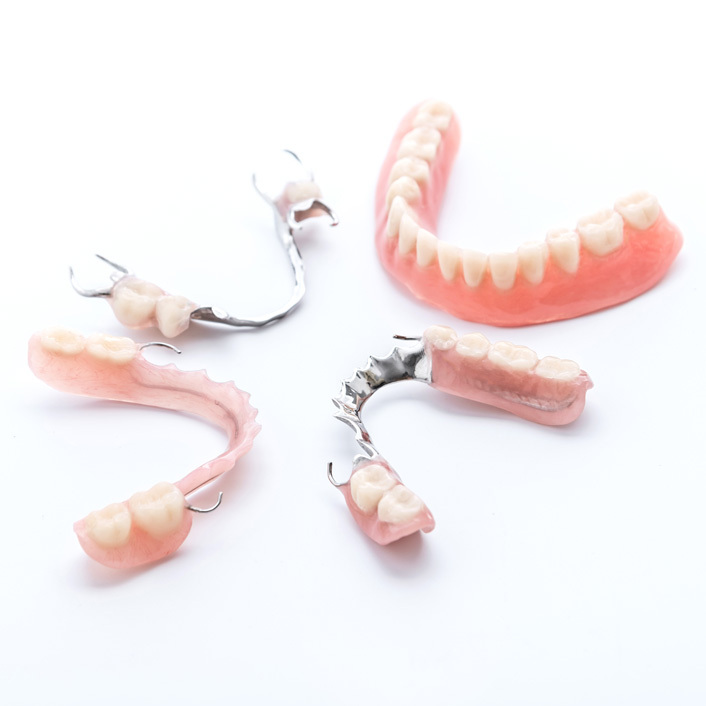 The complete dentures are custom created and natural looking. They function in place of your original teeth. Complete dentures are removable and may require adjustments in order to create a proper fit with the gums and mouth. A removable partial denture is used when one or more natural teeth still remain in the upper or lower jaw. Made of replacement teeth attached to a pink or gum-colored plastic base, partials help restore better functionality to the mouth. Partial dentures are removable and may require adjustments in order to create a proper fit with the gums and mouth.